Gopeshwar is a hill station situated in Garhwal Himalayas. It is lies between the Chamoli and the Chopta Valley. Gopeshwar is the headquarters of Chamoli district of the Uttarakhand state. It is located at the altitude of 1300 mt above from the sea level. It offers the amazing natural beauty and wonderful weather in every season. You can also see the amazing views of hills from Gopeshwar and also the amazing view of sunset and sunrise. The Gopeshwar is fulfilling with every modern facility so if you plan to visit Gopeshwar then you can get easily the markets items from there. The local language of Gopeshwar is Garhwali and Hindi. The Gopinath Temple: - The Gopinath temple is one of the great attractions of Gopeshwar, situated in the Gopeshwar city. The temple is dedicated the lord Vishnu. Many devotees are come here to seek the blessing of lord Vishnu. The Park: - The Park is situated approx 1 km far from Gopeshwar city. You can visit there and also see the amazing views of hills from the park. The Tungnath temple: - Tungnath is one of the famous temples of Lord Shiva in the Uttarakhand and all over India. Every year many of the devotees are come here to visit the temple. This temple is also one kedar on the five Kedars. Read more about Panch Kedar. The Rudranath temple: - Rudranath temple is also a famous temple in India. It is also known for one of the Kedar in five Kedars dedicated to Lord Shiva. The Chopta Valley: - Chopta Valley is one of the wonderful hill stations in Uttarakhand and also known as mini Switzerland in Uttarakhand. 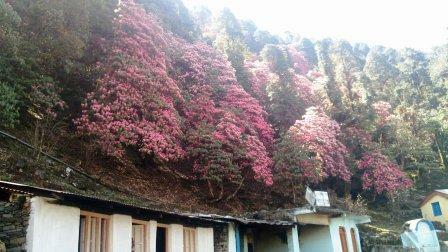 It offers various types of flowers valley, the amazing forests and the views of wonderful Himalayan peaks. Read more about Chopta. Best time to Visit: - You can visit any time Gopeshwar in the year but mostly Sept to Feb is the best time. By Roads: - Gopeshwar is well connected by roads transport from the major cities. By Trains: - The Nearest railway station is Rishikesh, and the distance from Gopeshwar is 220 kms. By Air: - The Nearest Airport is Jolly Grant Airport Dehradun, and the distance is 242 kms. For any type of trade query like Hotel Booking, Tour Booking, Cab Booking and other you may also contact us at onlineuttarakhand@gmail.com.